2016 full year passive income from non-REITs (Part 2). There is nothing wrong with speculation as long as we know we are speculating. Me? I am quite happy to hold on to my investment. As promised, this is Part 2 of a very long blog post. If you have not done so, read Part 1: HERE. Let us start this blog post with some gossip. Wah! Is Religare Health Trust going to be delisted? Anyway, three big things happened in the non-REIT space for me. 1. A big thing was receiving a much larger than usual distribution from Religare Health Trust (RHT) which I initiated a long position in sometime last year at 88c a unit. The special dividend (which gave me a yield of almost 30% based on cost) came from them disposing a share of an income generating asset due to regulatory requirement. 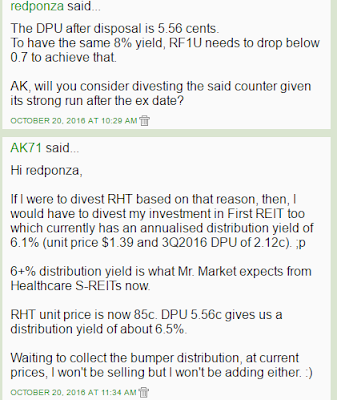 Including regular distributions this year, RHT has been a very rewarding investment for me. I am quite happy to continue holding on to my investment in the Trust as it continues to generate income. 2. Another big thing that took place in the non-REIT space was the internalisation of Croesus Retail Trust's management. There was a rights issue because of this. I took up my entitlement and also applied for excess rights. 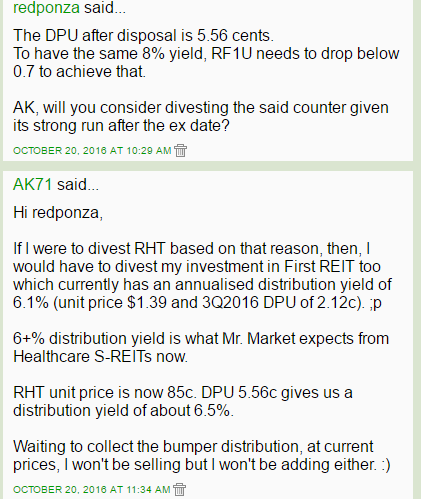 The rights units were priced at slightly under 80c a unit (and will enjoy a distribution yield of almost 9%). The size of my investment in the Trust increased by almost 6% as I took advantage of the exercise. 3. The third big thing is the offer to privatise ARA Asset Management at $1.78 a share. This is likely to be concluded by the middle of next year and based on my entry prices, I would get to enjoy reasonably attractive capital gains of 35% to 78% although I would miss the regular dividends. As I had a fixed deposit maturing and with the much lower interest rates offered by the banks this year for fixed deposits compared to last year (1.1% per annum at UOB for 13 months, for example), I decided to buy more ARA shares at $1.71 a share in late November. I believe that this is possibly an arbitrage opportunity which could give me an "interest rate" of about 4% over a period of, maybe, half a year. It could be higher because ARA pays dividends twice a year and another payout could happen in April or May. If it should happen, I could see a DPS of 2c to 3c if the privatisation process is not completed by then. Of course, to be realistic, there is a chance that the offer might not be accepted as I know some shareholders feel that the offer of $1.78 a share still undervalues ARA. 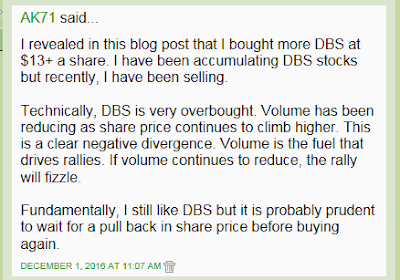 In such an instance, I would be quite contented to hold on to my latest purchase to receive regular dividends (for a 3% dividend yield based on a DPS of 5c or about 50% of EPS) as I also believe ARA is worth more and that its shares should trade at a higher price. Delist or stay listed, I am happy with ARA either way. This translates to S$ 8,803.44 per month. Source: A wealth building strategy that has worked for AK. Although I enjoyed some capital gains from a few trades this year (and the most recent trades being in DBS as its share price rose significantly for a few weeks), it is due to an emphasis on investing for income that has ensured further improvement in my financial health. 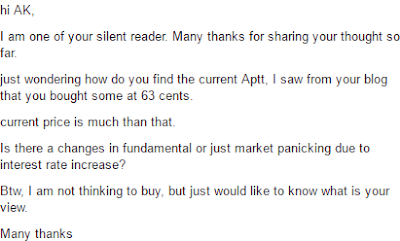 On this note, I will now say something about APTT because it seems that many readers were attracted to APTT by the relatively high distribution yield of 10% and bought into it. Now, many of them are worried because the unit price plunged. If we know the value of a stock, we would know if the price makes sense. 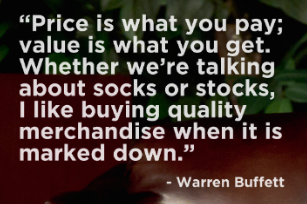 If we didn't know the value of the stock, we would never know if the price makes sense. If we don't know this, price movements would make us emotional. I said before that APTT's past DPU of 8c was unsustainable. Although the management reduced DPU to 6.5c, I said that it might be more prudent to have a DPU of 4c which, I felt, was more sustainable. That was because 4c would be closer to APTT's EPS. I don't know if the unit price will decline further but if it should, knowing what I know and all else being equal, I would probably be buying more. Investing in APTT, we are not investing for growth. We want its income generation ability. If you thought you were investing for growth when you got into APTT, you might have the wrong tool. Know what we want to do and use the right tools. For those of us who invested in APTT for income, ask if anything has happened which has damaged its ability to generate income significantly and, if something has happened, is the damage long lasting? Then, do what you have to do. Know what am I going to say? Yes, if AK can do it, so can you! And I hope you have found my blogs this year to be inspiring and helpful on your own journey towards financial freedom. LOL. 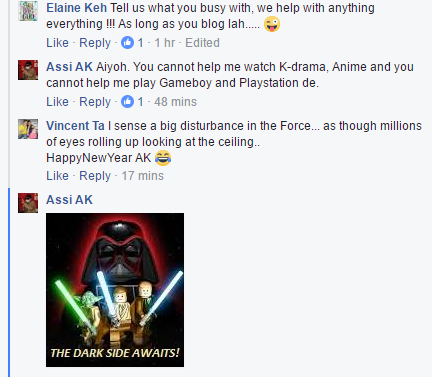 From my FB wall (1 Jan 17). 1. 1H 2016 income from non-REITs. 2. Breadtalk, OCK and QAF. 3. Made $1m investing for income. 4. 2016 FY income from S-REITs. While the overhang from Brexit and the US presidential election is over for now, heading into 2017, we expect continued weakness in oil-related stocks, softness in the property sector and higher impairment charges for banks to be some of the factors that will dent investor confidence in the Singapore market. While interest rates are likely to head higher, we believe the hunt for yield is not completely over and investors are still likely to accumulate quality high-dividend stocks. We expect banks to report low- to mid-single-digit earnings growth, and the outlook for the residential property sector is still soft after numerous quarters of decline and with no clear pickup in demand or selling prices. The oil and gas sector is still saddled with refinancing issues as well as a lack of orders and earnings. The telecommunications sector is also facing the threat of a new player. Please continue to talk to yourself, i am truly inspired by your sharing! Yes, please continue to talk to yourself! Always silently listening in. very inspirational. Thanks for your blogs. Is it possible for you to share with us approxiately what is your average yield for your total portfolio (REITs + non-REITs)? This is just a referencing point for me to access my own returns. "Interest crediting is in progress and will be completed by the 4th working day." I hope not. I would like to buy more on the cheap. -.-"
I recently found out that my blog does not sit well with some people and actually got on their nerves. It is fantastic what having a page on FB can do because whatever people do is collected as data. This includes negative feedback. Since I am unlikely to change my blogging style, I want a feel as to whether readers like what I am doing now. Years ago, when I was asked to share information on my portfolio, I didn't want to because I didn't want to reveal how much money I had invested. However, after some thought, I was OK with letting readers have a peek and to inspire them as to what they can do. I decided on revealing dollar value (because cash flow is what should matter most to us in life). Of course, if you are curious and hardworking enough, you could do some CSI in my blog and get quite a good estimate. A few readers have done that before in the past. Please continue talking to yourself to inspire others. There will always be naysayers, but I'm positively sure that those who appreciate your blog post far exceed those who don't. Bad AK! Bad AK! 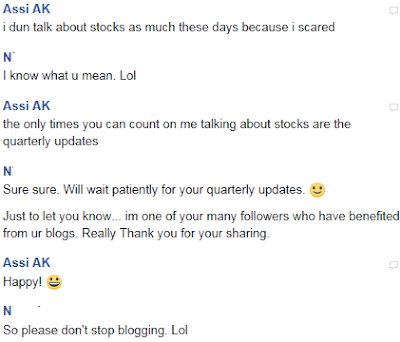 -.-"
Please continue talking to yourself on your stock purchase in your blog. You have inspired to save money like you and to buy income generating assets. So please please please continue. You are the one and only blogger I follow. Is 6% yield a fair target to strive for, based on SGX? Is 6% yield fair today? I think that is a difficult question to answer. There are so many factors to take into consideration. It could be a fantastic yield for certain stocks and it might not compensate for the risk we have to take for some other stocks. If you do not have the inclination to research individual stocks, you might want to buy into an STI ETF (a basket of stocks) which gave in most years since 2008 a yield of about 3%. Would to hear your comments on APTT. I did a rough calculation on the Free Cash Flow of APTT, it is about 2.3 cents per unit. So would like to hear your views even if APTT were to give 4 cents, it may still be not sustainable?? Can share how did you calculate the FCF? I calculated the Funds From Operations (FFO). EPS is about 3c but FFO per unit is higher as we add depreciation and amortisation expenses to the number since these are non-cash expenses. FFO should be about 6.5c per unit. So, although the EPS has fallen to about 3c, a DPU of 4c should be sustainable as FFO is still higher. I should mention that APTT has cautioned there would be additional CAPEX in 2017. This would impact FFO. Even so, I estimated FFO per unit should decline to about 5c in such an instance. The current 6.5c DPU could be reduced further but if we are expecting a more realistic DPU of 4c, I think we probably would be able to rest easy. I took the net cash from operations + interest received - interest paid - Capex to get the Free cash Flow. In this instance, I got 34 million. Then I divide by the number of shares outstanding which is then equal to 2.3 cents. I thought we should use Free Cash Flow to get the sustainability of dividends rather than funds from operation? I thought we should use Free Cash Flow to get the sustainability of dividends rather than funds from operation or even EPS? For you, I think the number that is the determinant is CAPEX. This is not a constant number and I am assuming CAPEX in 2017 to be $40 million. You are better prepared for retrenchment (if it should happen) than many people like some of your colleagues with more than a million dollars of debt and their luxury cars. Mentally and financially prepared for retrenchment. SAHW? Oh, sneaky! You good! OK, let me be the bad guy here. I'm 22 this year and just starting my investment journey. I'm very intrigued by income investing and would like to know if you have some books or information for me to learn more about this? I hope to generate as much passive income as you in the future too! Great job! Look for the box titled "Food for thought" in the right side bar of my blog. You will find links to some books there. Down the blog, you will also find boxes titled "Passive Income: A Journey" and "My methods and Philosophy". No books. Just me talking to myself. Aiyoh, don't use me as a benchmark. Stress. -.-"
Thank you for the direction! I'll be on my way to devour the wisdom and get started soon! No need stress lah. You've been doing really well! I was actually thinking of doing income investing in the US market but I see from you that it's possible in SG too. Thank you for your comments and views on APTT. This further affirm that you are the one and only blogger I follow and also my most beloved and darling blogger. This is also affirm that you must really continue talking to yourself with so many supporters behind you and not forgetting your darling here. Time for me to take a break. LOL. Internally managed to improve alignment and removes one barrier to a takeover. We maintain our BUY call with a higher TP of S$0.99. We believe the perception of a greater alignment between the interest of Croesus Retail Trust (CRT)’s unitholders and management following CRT’s move to be the first internally managed trust will help close the discount to our TP. In addition, with CRT no longer having an external trustee-manager, we believe this may remove a hurdle to a potential takeover by a J-REIT as speculated by some market participants due to CRT’s persistent high yield and discount to its NAV. Boost from recent acquisitions. Going forward, CRT should benefit from the full-year contribution from the acquisition of Torius property in Fukuoka (7.8% yield based on net property income (NPI)) in Sep15 and recent purchase of three retail malls (Fuji Grand Natalie, Mallage Saga and Feeeal Asahikawa) on 7.1% NPI yield. Medium-term upside potential from asset enhancement initiatives (AEIs). Over the medium term, CRT should also receive a boost from potential AEI and/or tenant remixing at One’s Mall, Torius Mall and Feeeal Asahikawa. Nibbled APTT at $0.38 today as price retreated. Hope it is a good entry price. 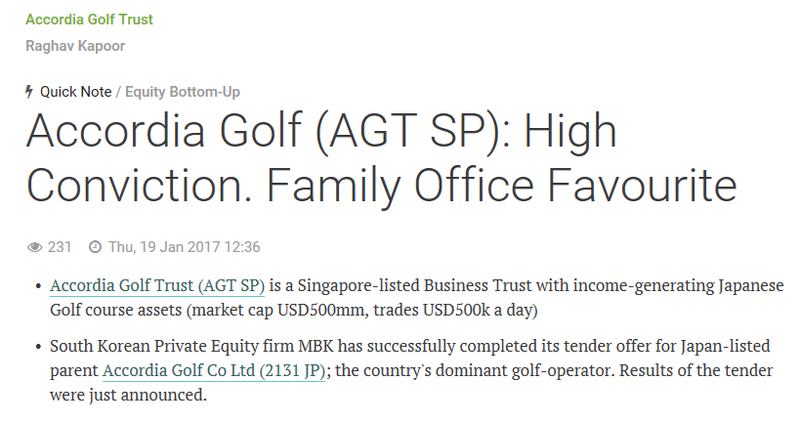 "Presently trading at 0.7x P/B, we are recommending a BUY on Accordia Golf Trust (AGT) with a target price of S$0.77 based on 0.8x P/B. AGT would be able to dish out higher distributions by 13.8% for 1H17 just from favourable FX movements alone, based on our SGD/JPY assumption of 75. 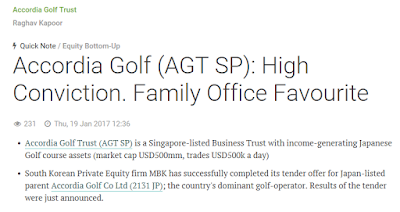 Valuations for AGT also seem attractive as its 89 golf courses have an appraisal value of JPY150.98bln (approximately S$2bln), which is much higher as compared to its market capitalisation of S$747.4mln and NAV of JPY80.59bln. Coupled with its low P/B of 0.7x and high dividend yield of 9.8% as compared to the FTSE Straits Times REIT Index which trades at 1.0x P/B and 5.6% dividend yield, we thus believe that AGT should trade up to 0.8x P/B which represents a signifi cant 20% discount to the sector average." LIM & TAN. looks like Hon Hai boss is buying 'em up too. APTT prices seem to have stablised at this rang for now. At 38cents and a possible DPU reduction to around 3-4cents which I can accept, i am vested small. It is reasonable to believe that all investments are good at the right price. "... been thinking whether to sell my small investment in appt when a fren asked me to read your blog... can share how much did you buy at 37.5c?" "You really have to ask if APTT has become a more attractive investment for you at 37.5c? Is it doing the job you expect it to do? Anyway, I more than doubled my investment in APTT when I bought more at 37.5c and, later, 38c a unit recently. You should remember that this should have no bearing on your decision making process." Looks like your thrust in APTT has been validated. According to the bankruptcy filings, Ezra declared that its owes DBS more than US$327mln in both secured and unsecured loans while OCBC is owed more than US$280mln and UOB US$33mln. Separately, Ezra also declared assets of up to US$1bln against liabilities of as much as US$500mln. We understand that the 3 local banks have made full provisions for their exposure to Ezra, hence we believe the latest bankruptcy announcement should not come as a surprise and maintain our “Neutral” view on the 3 local banking stocks given their fair valuations of 11-12x PE, 3-4% yield and 1.1-1.2x book.